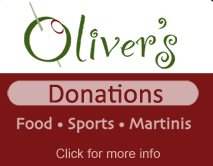 Thank you for considering Oliver’s for your team sponsor. While we make every effort to accommodate all requests, due to the number of requests we receive, we are simply unable to accommodate all requests. In order for your team to be considered for sponsorship, please review our team sponsor policy. All team sponsorship requests must be submitted via email to teams@obg.com. All requests must be submitted 6 weeks prior to start of season. All emails must include a scanned copy of our donation request form, scanned copy of the event flyer, scanned copy of tax letter if applicable. To ensure delivery of the scanned copies, files should be in pdf form. Learn here for more. Thank you for considering Oliver’s as a contributor. We wish you the best of luck with your charitable event. Day of week games are played? Number of players on team? Men, Women, or CoEd league? You need to enter valid email address here. Your address will be added to our mailing list.